Queen's University at Kingston[dead link] (commonly shortened to Queen's University or Queen's) is a public research university in Kingston, Ontario, Canada. Founded on 16 October 1841, via a royal charter issued by Queen Victoria, the university predates Canada's founding by 26 years. Queen's holds more than 1,400 hectares (3,500 acres) of land throughout Ontario and owns Herstmonceux Castle in East Sussex, England. Queen's is organized into ten undergraduate, graduate, and professional faculties and schools. ^ a b "An Act Respecting the Incorporation of Queen's Theological College" (PDF). Queen's University. July 2005. Retrieved 26 July 2011. ^ Frankson, Greg (2001). "Profile of Robert Sutherland". Queen's University. Retrieved 8 August 2011. ^ "Theological Studies program at Queen's". Retrieved March 16, 2019. ^ "Acknowledgement of Territory | Four Directions Aboriginal Student Centre". queensu.ca. Retrieved 2018-03-22. ^ Rideout, Dave (November 29, 2018). "Mitchell Hall ready to open its doors". Queen's University. Retrieved March 18, 2019. 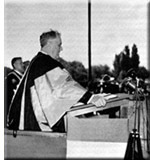 ^ "About the Principal | Office of the Principal and Vice-Chancellor". www.queensu.ca. Retrieved 2018-11-05. ^ "Queen's announces appointment of 21st Principal and Vice-Chancellor". Queen's Gazette | Queen's University. 2018-11-04. Retrieved 2018-11-05. ^ "History". Office of the Rector. Retrieved 2018-11-05. ^ "Rector". Queen’s Encyclopedia. Retrieved 2018-11-05. ^ Rector, Office of the. "Office of the Rector". Office of the Rector. Retrieved 2018-11-06. ^ "Committees and Other Duties". Office of the Rector. Retrieved 2018-11-05. ^ a b "The 2015 Nobel Prize in Physics – Press Release". www.nobelprize.org. Retrieved 2015-10-06. ^ "Congratulations to Dr. Art McDonald for the 2015 Nobel Prize in Physics! | Department of Physics, Engineering Physics & Astronomy". www.queensu.ca. Retrieved 2016-02-01. ^ "Immunology of Bacille Calmette-Guérin and Related Topics, R. Wittes, Clin. Infectious Dis. 31:S59-S63, 2000". cid.oxfordjournals.org. Retrieved 2016-04-15. ^ "Studio Q: gains and losses". The Journal. Retrieved 2018-11-06. ^ "West Campus Fields". Queen's University. August 3, 2016. Retrieved 12 August 2016. ^ Pattison, Mike (August 18, 2018). "Women's Soccer Claim Old Four Tournament Title, Men split weekend 1-1". 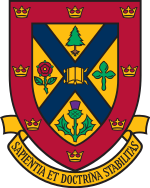 Queen's University Athletics and Recreation. Retrieved March 18, 2019. ^ "The Nobel Prize in Chemistry 2016". Nobelprize.org. Retrieved 6 Oct 2016. ^ "Stoddart Mechanostereochemistry Group". Northwestern University. Retrieved 6 Oct 2016. ^ "Patent US4663437 - Atrial Natriuretic Peptide". Retrieved 2016-04-15.